Instantly compare selected filters or effects while editing the photo. Save the best result to suit your own finest preference and make editing truly a blast. Your photos end up looking amazing. Create photo editor collections of your favorite filters and effects right away with 1-tap access. Get more from Store to flourish your creativity and do so much more little & big editing things: stunning photo effects, filters, textures, bundles. Forget those annoying & odd interfaces! Filterra is as plain as day, so you just run it and immediately get your snap looking just right. Tag your photos with #filterra! The best ones will be shared on our Instagram profile! Join our like-minded Filterra family, see the best pics made with the best photo editing app and let us get the beauty spread! As a member of Filterra Premium, you enjoy unlimited access to our huge exclusive set of Pro-Level Features & Amazing Members-Only Benefits, with no ads! 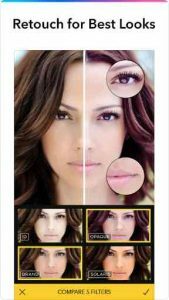 Over 1M Filter & Effect combos, Pro Camera, Portrait Tools, Essential Beauty Collections and more! 2 subscription options: annual (12-months, $2.99 USD per month, full pre-payment), monthly ($3.99 USD, 7-day free trial). By subscribing you get unlimited access to all the app’s functionality for the whole duration of your subscription period. Account will be charged for renewal within 24-hours prior to the end of the current period. “Free trial” > $3.99/month, or renewal equals to the initial subscription chosen and its current price unless a special price is offered. You can cancel a free trial, manage your subscription and turn off the auto-renewal anytime through your Account Settings. This must be done 24 hours before the end of a free trial or subscription period to avoid being charged. As soon as you purchase a subscription, any unused part or time-span of a free trial period will be forfeited. The app is not fully compatible with iPhone 4s. Certain functionality offered by the app may not be supported. Requires iOS 11.1 or later.